Is Centene Corp (NYSE:CNC) worth your attention right now? Hedge funds are taking an optimistic view. The number of long hedge fund bets moved up by 7 in recent months. Our calculations also showed that CNC isn’t among the 30 most popular stocks among hedge funds. At the moment there are many gauges stock traders employ to assess their stock investments. Some of the most under-the-radar gauges are hedge fund and insider trading moves. We have shown that, historically, those who follow the best picks of the elite investment managers can outpace the broader indices by a very impressive margin (see the details here). We’re going to take a look at the recent hedge fund action regarding Centene Corp (NYSE:CNC). How are hedge funds trading Centene Corp (NYSE:CNC)? Heading into the fourth quarter of 2018, a total of 49 of the hedge funds tracked by Insider Monkey held long positions in this stock, a change of 17% from one quarter earlier. 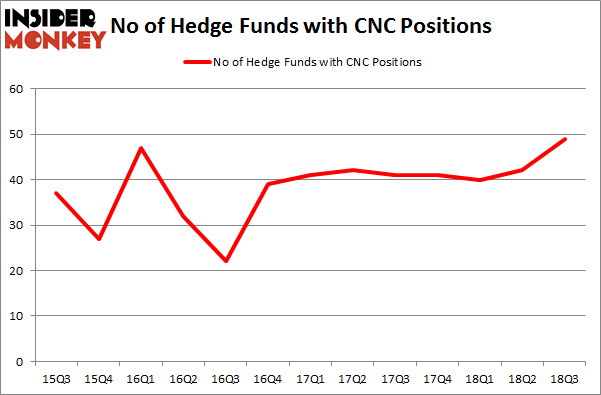 The graph below displays the number of hedge funds with bullish position in CNC over the last 13 quarters. With hedgies’ sentiment swirling, there exists a few noteworthy hedge fund managers who were boosting their stakes significantly (or already accumulated large positions). More specifically, AQR Capital Management was the largest shareholder of Centene Corp (NYSE:CNC), with a stake worth $435.7 million reported as of the end of September. Trailing AQR Capital Management was Millennium Management, which amassed a stake valued at $163.4 million. Southpoint Capital Advisors, Two Sigma Advisors, and Maverick Capital were also very fond of the stock, giving the stock large weights in their portfolios. As aggregate interest increased, specific money managers were breaking ground themselves. Renaissance Technologies, managed by Jim Simons, created the most outsized position in Centene Corp (NYSE:CNC). Renaissance Technologies had $63.5 million invested in the company at the end of the quarter. Samuel Isaly’s OrbiMed Advisors also initiated a $48.8 million position during the quarter. The other funds with brand new CNC positions are Peter Rathjens, Bruce Clarke and John Campbell’s Arrowstreet Capital, Brad Farber’s Atika Capital, and Efrem Kamen’s Pura Vida Investments. Let’s also examine hedge fund activity in other stocks – not necessarily in the same industry as Centene Corp (NYSE:CNC) but similarly valued. We will take a look at Pioneer Natural Resources Company (NYSE:PXD), NXP Semiconductors NV (NASDAQ:NXPI), Fortive Corporation (NYSE:FTV), and Telefonaktiebolaget LM Ericsson (publ) (NASDAQ:ERIC). This group of stocks’ market values resemble CNC’s market value. As you can see these stocks had an average of 46 hedge funds with bullish positions and the average amount invested in these stocks was $3.34 billion. That figure was $1.98 billion in CNC’s case. NXP Semiconductors NV (NASDAQ:NXPI) is the most popular stock in this table. On the other hand Telefonaktiebolaget LM Ericsson (publ) (NASDAQ:ERIC) is the least popular one with only 13 bullish hedge fund positions. Centene Corp (NYSE:CNC) is not the most popular stock in this group but hedge fund interest is still above average. This is a slightly positive signal but we’d rather spend our time researching stocks that hedge funds are piling on. In this regard NXPI might be a better candidate to consider a long position.